Losing weight isn’t hard. It doesn’t require you forgoing all your favourite foods, or become a gym rat. All it really takes is some motivation and a change of perspective. My book is based on my experience, from years of failed yo-yo diets and workout routines to finally achieving long-term weight loss after a simple change of mindset and habits. Do you need to change your perspective on the state of your weight? Challenge your thinking with Mark Guo, who has documented his own change of mindset in his debut book ‘The Goldilocks Formula’. Mark, what inspired the underlying change of mind that led to this book? It all started with a drawing of my 3-year old daughter, where I looked so comically fat that I couldn’t lie to myself any longer. I finally started to take weight loss seriously and treated it as a priority. Little kids have a great talent for changing your perspective on life! So, this experience was just the first of the many that were included in this book? Absolutely. Everything in this book, both good and bad, is based on my own experiences. Once things finally started to click, and the pounds came off almost effortlessly, I couldn’t believe it. This lead to many personal epiphanies, and eventually this book. For people who have been trying to lose weight the idea of having an epiphany and then watching the weight drop off seems to good to be true. What was the biggest personal epiphany or information surrounding this epiphany that you wanted to communicate to readers? There’s too much confusion in the area of weight loss right now. The normal diets and exercises either don’t work, or are too taxing, therefore not sustainable. There are much simpler and sensible ways, based on timeless principles of human biology and psychology. Learning simpler and more sustainable ways to lose weight must have left you with a great feeling. Was learning and applying these methods most rewarding for you, or did you find greater rewards elsewhere in the writing process? I’ve always enjoyed reading and writing. The process of completing this book, which took a few months of writing every day, was very satisfying. Too bad I can’t say the same about the promotion part. Book promotions is another skill that you’ll learn along your journey of being a self-published author. Looking back on the entire experience from the initial inspiration to the publication and promotion, where do you feel you’ve learnt the most? Editing can take just as long as writing. And promoting a book is actually harder than the writing part, at least for me anyway. We’ll touch on promotion in a little bit, but first I’m curious to find out about how you tackled the writing process. When you started working on The Goldilocks Formula, did you know how the book was going to end? Since it’s non-fiction, yes I know exactly how it’s going to end. 🙂 I do have a chapter outline before I start. Do you have a daily target that helps you hit those chapter outlines? 500 words a day. That’s my sweet spot. Does that sweet spot of 500 words a day apply for editing, or do you find that editing is best left to someone else? I hired someone on the interwebs to do it. I was very lucky in that we hit off right the way, and understood each other very well. As you’ve kept writing and sought feedback from your editor, do you feel that your writing has improved? The more I write, the better the quality gets. I suppose it’s like a muscle, use it or lose it. Do you feel that by exercising your writing muscle has, in turn, led you to think about the author brand that you are creating? Has branding already appeared on your author radar? Aren’t all authors their own brand? I inherently like to connect with others on some level. With this book, I hope it will help others get in better shape. In the future, I intend to write books on other topics, with the same purpose of connecting and helping others. Are you working on any new writing projects at the moment with this same purpose of connecting and helping others? More books, on different topics, I haven’t decided on which ones yet. When you do decide what to tackle next, what thoughts will be in your mind as you write? Always stay true to my voice, and make each word count. What have you done in the self-publishing arena that you believe has made each of your words count? I’m way too inexperienced in this business to be giving out tips. Inexperience doesn’t mean you can’t give out tips. I find that those new to the game might have better suggestions as they aren’t hindered by the past. As there aren’t tips to share today, instead I’d like to know why you write? To express myself, and hopefully to help and entertain others at the same time. One of my favourite ways to entertain is to the explore the unexpected. Let’s do a little entertaining today with a few unexpected questions outside of the realm of day-to-day writing with, what is your zodiac sign? Leo, and a Tiger in the chinese Zodiac. I’m a big cat no matter how you look at it. I’d be interested to see how a big cat deals with fear. What happens when you get scared half to death twice? I would have 1/4 life left. And with that 1/4 of life left, what would be your favourite word to grace your lips? There are few words as robust as ‘and’, I can see why it’s your favourite. We’ve worked through the few unexpected questions today to arrive at the final question, which is one of my personal favourites, what is your best tip for authors? Coffee and writing fits better than a tailored suit. Coffee and writing are also bound to last longer than that tailored suit as well! Mark, thanks for joining me today to explore a little of The Goldilocks Formula with the readers and I hope you continue to learn and love your writing career. Excited to read the book we discussed today? Find it here on Amazon: ‘The Goldilocks Formula ( ASIN: B077WG2HKV )‘. 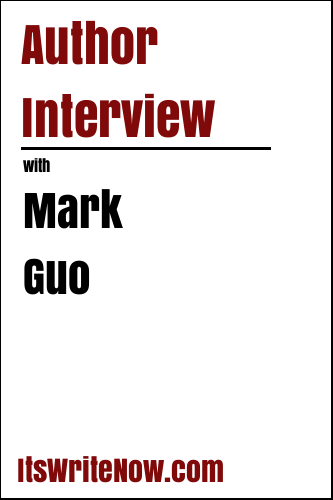 Want to find out more about Mark Guo? Connect here!